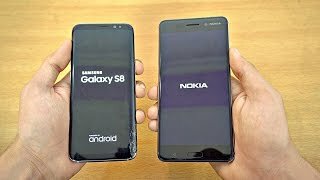 Samsung Galaxy S8 vs NOKIA 6 Speed Test. How much of a speed difference there is between a budget Nokia 6 vs Flagship BEAST Galaxy S8? Let's find out. Hey guys it's time to do a speed test comparison between the nokia 6 versus the Samsung Galaxy s8 I want to see how much of a speed difference there is between the mid-range the super budget-friendly Nokia 6 versus the flagship phone from Samsung the Galaxy s8 so I'm just gonna quickly boot up both devices at the same time 3 2 1 go and both phones are and on Android 7.0 a new good and you can see the size difference difference between these two phones Nokia 6 being 5.5 inch it's a. Display size and still it's like almost like a little bit bigger in terms of the height and you can see the galaxy I said obviously you can expect it to be faster in terms of booting up it is faster pretty much in comparison to any phone that I've tested out so and the Nokia 6 is not done so you can see the difference between the boot up and obviously this is a $250 phone and this will be potentially 750 to $800 phone so yeah moving on to the apps opening so same Wi-Fi network remote devices and everything is closed up in the background we have 4 gigs of ram on the nokia 6 as well as for Gizem for him on the s8 spare again 808 on the nokia 6 versus the Exynos 88-90 5 processor so again it's going to be a very unfair test for the nokia but like I said I'm just testing out how much of a speed difference there is how much you are actually paying for if you go for the s8 so I mean this is this is gonna be a really interesting test starting off with the first basic phone dialer application 3 2 1 go and faster on the. Galaxy s8 next we got settings and that. Was about the same on both phones let's see if we go back and try out some third-party stuff so we have Instagram launching in 3 2 1 go. Okay the Nokia six was faster there with the latest feed followed by the galaxy s aid actually have a game gun Fuu stickman do and of course this where the s8 will fly but gives me the difference about one second difference there got color switch Samsung Galaxy I said. Done and again about 1/2 second difference the nokia 6 volts right behind let's see we have subway surfers. Ok the display looks absolute beautiful absolutely beautiful on the note the Galaxy s8 of course that's the main attraction against the s8 just fly through subway surfer and that was a long difference in terms of time loading. So you can see whoa that was awfully. Long time there snapchat and I think bit quicker on the galaxy s 8 and you guys are the judge here going into the app drawer the the Nokia 6 is having like completely like almost stock Android almost 0 bloatware so that's a good thing we have tinder faster on the Samsung Galaxy s8 checking out viber. Gain samsung galaxy s aid but the difference is in front of you we got some more stuff such as uber Galaxy s8. Twitter we have another game smash hit. And you can see the galaxy estate is. Done and the Nokia 6 is also done so. About 5 second difference proxy made so yeah overall you can see the difference there the s8 of course you pay more you get the best speed but for those of you who are currently having the Nokia 6 I want to say that like a slow phone by any means like I mean just holding up great like it's not lagging or anything like that to LA so you'll be opening up the camera okay let's go and galaxy sa done followed by. Nokia six so that is the completion of our apps opening moving on towards the browser test alright first off we have Wikipedia calm org and as you can see. The Nokia six is done faster there followed by the Samsung Galaxy s8 so that was a great win they're actually the first win not the first second win to the goes to the Nokia six and scrolling and everything looks smooth on both phones same thing with zooming in and out you can see you won't be having any lag on that let's launch facebook.com and that. Is also faster only Nokia six fall by the Galaxy s8 so it clean win there when it comes to the browser and you know that was that was pretty interesting and very unexpected so checking out the RAM measurement on both devices so I'm really impressed with the Samsung Galaxy I said it has proved it's worth in the speed test that I did with different devices different phones but Nokia six you can see keeping everything there I mean four gigs of RAM like I said it's a super enough for having that amazing Ram management experience you can see everything is still there snapchat tinder okay tinder got refresh. On the Nokia six so you can see Viper. That is still there so one refresh not super perfect okay second refresh there you'll get six with the two refreshes Twitter that is there and smash head also got refresh. The Nokia six with four gigs of RAM not truly perfect I expected to be perfect like I mean Samsung mid-range phones that have four gigs of RAM has a great you know RAM management but again how are we doing some more tests of this phone but right now it's looking that it is is not truly good with the RAM management but yeah it was a test to show you guys how much of a difference there is between a $250.00 nokia 6 and a 7 $50 Samsung Galaxy s8 I.